First, download and install the Direct Link Tracking add-on. If you're unsure of how to install an add-on, see our installation guide for AffiliateWP (the instructions are the same). 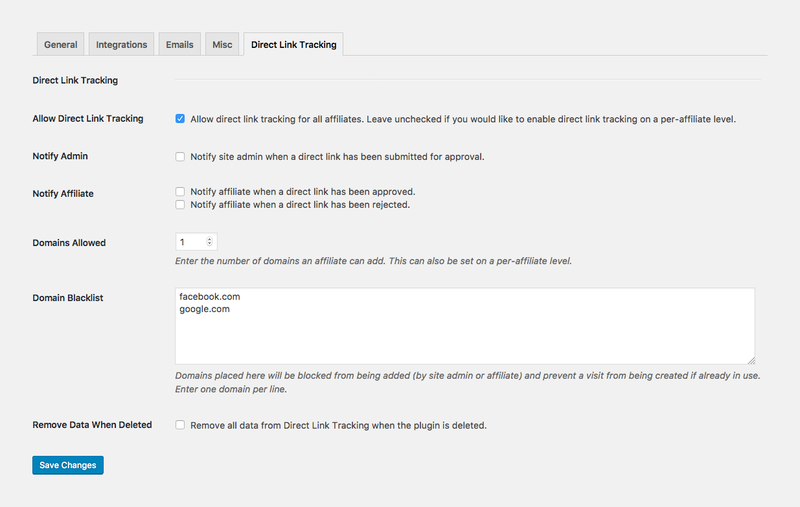 Once installed, navigate to AffiliateWP → Settings → Direct Link Tracking. When checked, this will enable all affiliate accounts to enter one or more domains from the Affiliate Area. If this option is left unchecked, domains may only be entered by affiliates that have the option enabled on their account, which must be done by a site administrator. See additional information below on enabling direct link tracking for individual affiliates. When enabled, an email will be sent to the site administrator when a direct link domain has been submitted for approval. If these checkbox options are enabled, an email will be sent to the affiliate when their submitted direct link domain has been approved or rejected. This option defines the number of domains affiliates can register on their account. For example, if this is set to 1, affiliates will only be permitted to register a single domain on their account. Note: This option can be overwritten on individual affiliate accounts by site administrators. Enable the checkbox if you would like all of Direct Link Tracking's data deleted when the plugin is deleted. Each affiliate account can have the global options overwritten by a site administrator from the Edit Affiliate screen for the affiliate. Once direct link tracking is enabled, either for an individual affiliate or globally, domains can be registered on the affiliate's account.